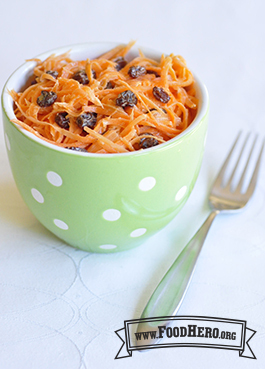 Combine carrots and raisins in a serving bowl. Mix low fat mayonnaise or salad dressing with yogurt or orange juice. Pour mixture over carrots and raisins and chill until serving time. 3 Comments for "Carrot Raisin Salad"
I make this and add 8 oz can of crushed pineapple. You can drain it or use the juice in place of the orange juice. I like to add a small handful of chopped nuts or seeds - chopped almonds or sunflower seeds are my favorite in this salad. I liked the carrot and raisin combo. It seemed a little unusual at first but it tasted really good!